In a box at home I have a postcard. In fact I have quite a few postcards but this is a particular favourite that I used to daydream over when I was young. I like to think it was sent by my well-travelled Nan, but memory being the tricky beast that it is I guess it could have come from another travelling friend or relative. 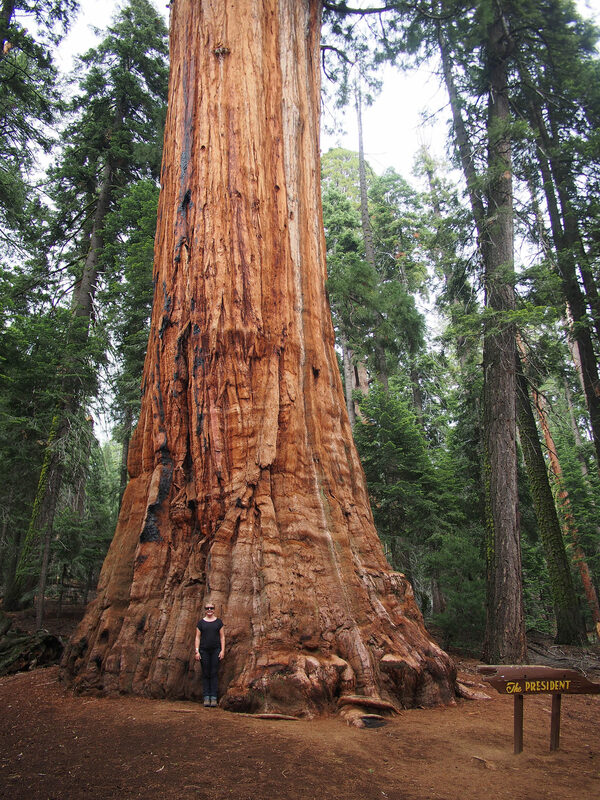 It was of a small, blonde girl, in a blue dress, standing in front of giant California redwood tree. In my imagination it was me. 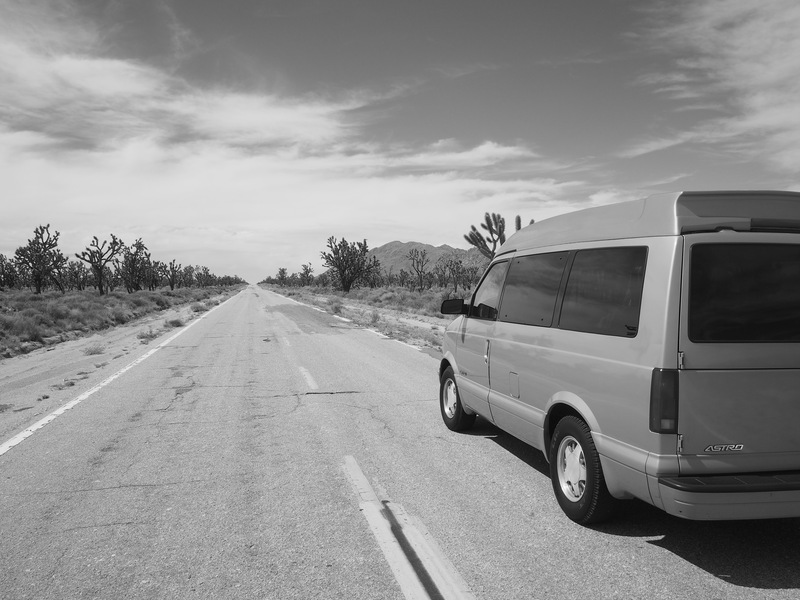 Meet Astrid, our ’98 Chevy Astro Van. She’s a little beauty. Alan is a wee bit in love with her. After we got her we spent a couple of days in Jon & Tam’s driveway in Palo Alto, tricking her out with some storage and a sleeping platform (including our first ikea hack). 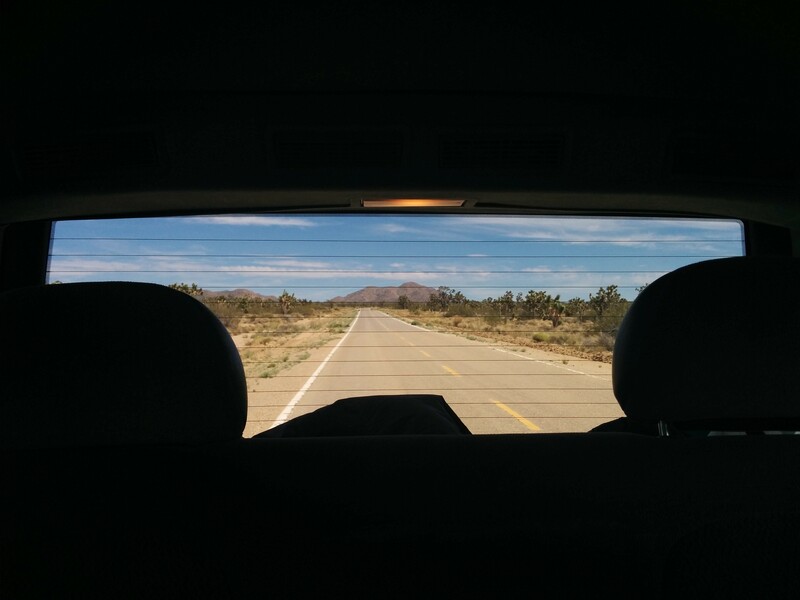 We scoured Craigslist for weeks looking for just the right car to go roadtripping in. I was dreaming of a wood-panel sided station wagon a-la Brady Bunch, but they just weren’t big enough (or reliable enough). Or a VW Vanagon, but they were a bit pricey. Or a Subaru Forester, but they seemed too same-same as home. Or a big campervan, but they have V8 engines and would eat gas. We’d never heard of a Chevy Astro until we saw one drive by. When it came down to it we spent three days looking at Astros until we found Astrid. I mostly picked her because I liked the 4’10” Mexican lady with four kids who’d bought her as her first car when she moved here and driven her for nine years (nearly all the Astros on Craigslist were being sold by Mexicans). Alan mostly picked her because she looks a bit mean. And of course she was purdy and had many bells and whistles and (almost) all her parts. American – for authenticity, as in ‘drove my Chevy to the levy’. Big, but not too big – V6 to get us over the high mountain passes, but not too much of a gas-guzzler. (Turns out we’re getting almost 20 miles to the gallon, and she’s actually shorter than a people mover although at 7’2” we have to watch it when we park her under cover). Can sleep inside – very important for a number of reasons, not least of which is the ability to stealth camp when necessary/practical. She’ll come in handy when we sleep in a Walmart carpark (it’s a thing here and I have a hankering to try it) and in order to bush camp on Bureau of Land Management lands, as well as #vanlife ‘overnight parking’ which is allowed in some states. 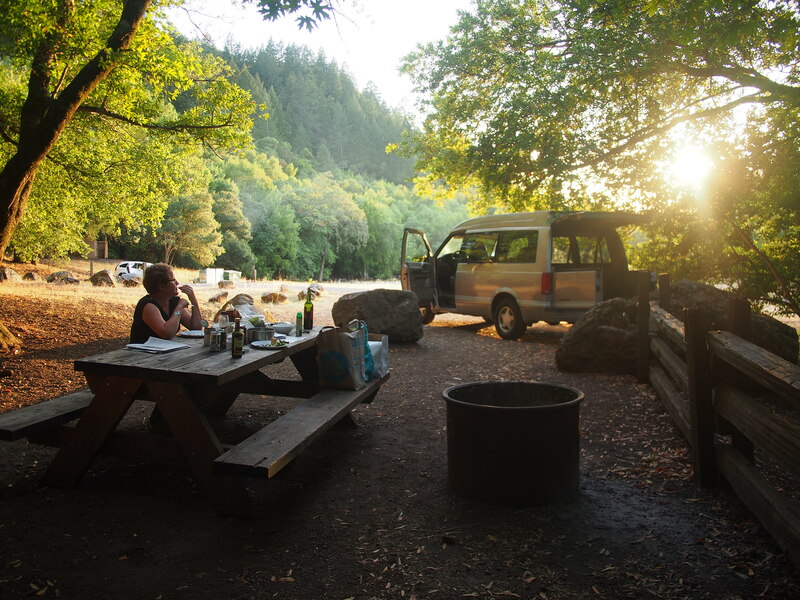 Also, many RV parks don’t have tent sites, and we’re finding that those that do can sell out fast. Astrid lets us camp on a concrete slab if we need to. Comes with TV and VHS. I didn’t even realise this was on the list, but it really tickles Alan’s fancy, and I think is the thing he loves most about her. Even though the TV doesn’t work because it’s too old to get digital reception, and we have no videos to play in it. In fact, Jon was most enthusiastic about taking out the TV and mounting an iPad in it’s place, but that is a step too far for Alan. I reckon we’ll get to journey’s end without having used the TV at all! One might think that the first thing to do after buying a car is to register it? Maybe service it? But no! The first thing to do is kit out the inside for sleeping and camping! Luckily Jon & Tam’s driveway is wide and vacant. We spent a day building a platform in the back, pulling out one row of seats and some seatbelts, hacking a support for it from Ikea furniture and rigging a removable sleeping platform. Lucky we had a lot of practice before we left home, and lucky Home Depot cut wood to size – although there was still a lot of hand sawing to be done. Two long sleeping platforms are removable and store flat on the floor during the day. Removable screws to hold everything in place when assembled. Centre leg between the trofasts. …and with all the storage. With this important work completed we turned to bureaucracy. One of the difficulties with buying a car can be registering it (for which a social security number and an address is needed, tick) and insuring it (many insurance companies won’t insure you on a foreign license). If I’m moving here for good and should therefore act like I mean it, and since you can only drive legally on a foreign license for up to 3 months, it seemed prudent to get myself a Californian drivers license. There were three challenges to this. 1. When you come to the USA, any electronic history that could do you any favours ceases to exist. I’m sure that anything incriminating follows you around, but as far as credit ratings and driver licenses – zap! It’s like you just turned 18 again. So, despite having driven for the past 26 years, I found myself having to sit a written road rules test and also doing a behind-the-wheel test. 2. Getting an appointment can be half the battle. 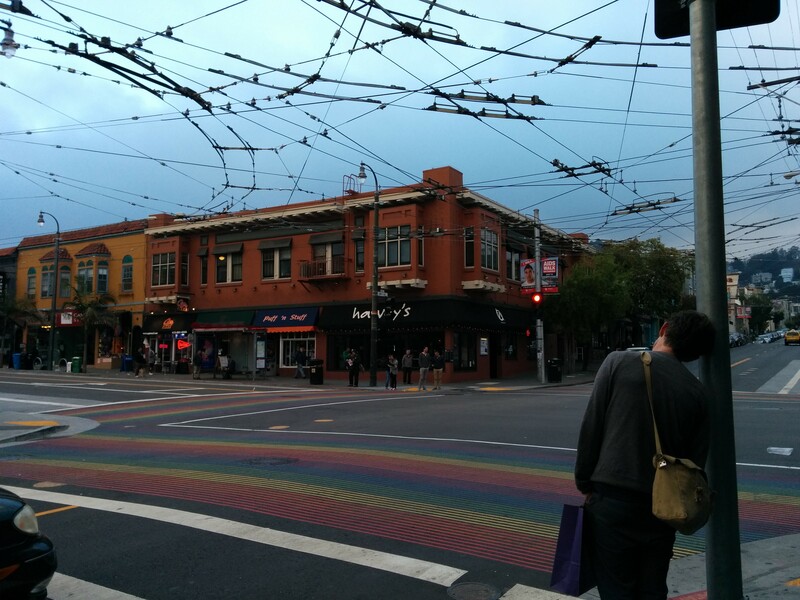 The San Francisco office had waits of 6 weeks, and the Palo Alto office had waits of 3 weeks. So it became a game of where-are-the-small-town-DMV-offices-that-are-remotely-near-where-we-might-want-to-be? After a couple of false starts, I ended up with one appointment in San Jose where we registered her and I sat the written test, and then a second (bookable only after you have passed said written test) two days later in a town we had never heard of, called Visalia (chosen purely because it was en route to Bakersfield and had a timeslot). We ended up seeing more of Visalia than we hoped, but more on that later. 3. One must bring a car that is roadworthy. Awesome as Astrid is, she is not technically roadworthy due to her very attractive windscreen chip and also a busted side mirror (since fixed). So we hired another Yaris to do the dirty work. I want to say that I passed both tests with flying colours. But I just scraped through the written test due to not studying the section on fines combined with my general confusedness around line markings (yellow, white, dotted, double, eek!) I did ace the behind-the-wheel test though. I managed to stop at all the right lines and only lost marks for things that are habits learnt of driving on the left (like checking over my left shoulder too much and my right not enough) and for driving too slow because the speed limit signs blend in to the roadside too much (hello? heard of red paint here?). Something we discovered is that despite Americans being proud of how well their cars are looked after, generally speaking, this seems to mean they’re washed often, and the oil is changed. But anything more – forget about it. Astrid had a very impressive sheaf of papers for her service history – but turns out nothing but oil had been done for 9 years. We were worried that we were losing coolant, an important consideration when about to drive across desert in 104 degrees, so whilst we were in Visalia and had a hire car for the day we decided to get her checked out. Turns out the cooling system was cactus. Leaking gaskets, faulty water pump, busted thermostat, dodgy radiator, the works. The good news was that everything else was OK. So we ended up getting a whole cooling system overhaul, spending half again what we paid for her and having three days with the Yaris (luckily Sequoia and Kings Canyon NPs were close by) before finally getting her on the road. Arriving into San Francisco was humbling. Flying over the suburbs of a new city I’m always struck by how ‘same’ the world is. Why do I leave Melbourne to come to another big city, filled with more people, all working to pay for their material things? All these people on the other side of the world, just doing the same thing as the people at home. I’m reminded that what I am trying to escape, to find, when I travel is myself. And I’m still with me! 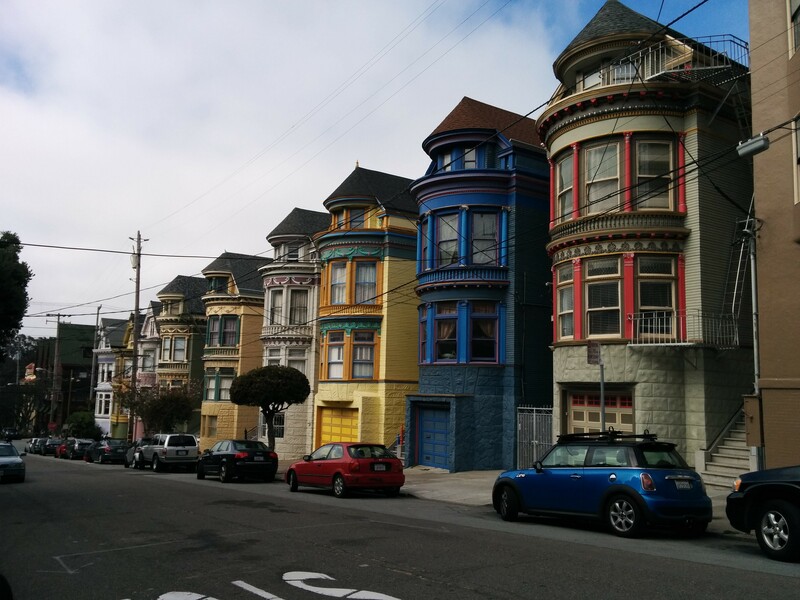 The generosity of friends meant that we had use of an apartment in the Lower Haight – very central, and very cool (thanks J and V). And thank goodness. Jetlag and the culture shock of not knowing how anything works always zonks me for about a week. It was so lovely not to add to that the pressure of expensive accommodation and no internet to our days (I am resigned to the fact that internet is pretty damn important to my way of life now). In San Fran we took it pretty easy – hanging out in local cafes (I may be the only Melbournian who actually likes American coffee), lots of walking through the new-and-yet-strangely-familiar streets, catching the Muni up and down (didn’t manage to catch the tram from Melbourne, although we rode on ones from Milan, Lisbon, Philadelphia), realising how big the city is even though it looks kinda small on the map, visiting the Castro (to see the rainbow-coloured crosswalks), Haight-Ashbury’s hippie shops and street festival, Alamo Square (disappointing as the houses weren’t nearly as colourful as in pictures [link to Jannie’s pic]), cycling through the parks and over the Golden Gate Bridge (windy). The Presidio park is home to a number of Andy Goldsworthy’s sculptures and I was pretty happy to see these in real life. Traveller, or immigrant? I feel torn between being a tourist, and the thought that, actually, we might stay here. I can stay here. How will that work out? I’m finding it difficult to play both roles. As well as playing the tourist we have begun to navigate the bureaucracy of living here – bank accounts, a credit record, drivers license, car purchase and registration. I am not sure whether the bureaucracy here is worse than at home, or whether it’s just that I don’t understand it. Either way, it is driving me mad. Despite being told to keep my social security card safe at home, that I would only be required to quote the number (both the USCIS and Janet told me this), the bank wanted to see it in order to open a resident’s account. Not because they need to see it, but because it’s so new, and has not much activity. And the DMV want to see it in order that I get my California driver’s license. Since my card was stored so safely (!) at J&V’s place that I could not find it, I opened a non-resident alien bank account for now but the delights of sitting my drivers’ license written test, and taking an actual driving test on the WRONG SIDE OF THE ROAD still await. The good news is that I did find a company who will insure our yet-to-be-purchased car without me having a local license. Yippee! Alan is giving Craigslist a workout as I type. I am dreaming of this. The June gloom meant that the days were cool and foggy, not quite the summer we had been expecting. That changed pretty soon though. We hired a car (like this) for 10 days and headed out of San Francisco and straight to the hills. The big, beautiful, granite ‘hills’ of Yosemite National Park. It was sunny and warm and perfect. And the hills were 9000 feet high with snow on them. And it was still sunny and warm and perfect. Being summer, it was ridiculously busy. The campsite reservations book out months in advance, as do a lot of the backcountry walk permits and the gold Wonka tickets themselves – permits to climb Half Dome (only 300 of these are available per day and they go fast). But, there is a quota reserved for ‘walk ups’, on a first-come first-served basis. Get into camp before lunchtime and you should be able to score a site, queue for 2 hours the day before your hike and you might be able to score a backcountry permit. This caused us great angst on our trip in – would we or wouldn’t we have somewhere to sleep, were we prepared to queue despite our anathaema about queuing for anything, what was our back up plan? In spite, or perhaps because, of our worrying we easily got a campsite – we’re not quite in peak season yet. 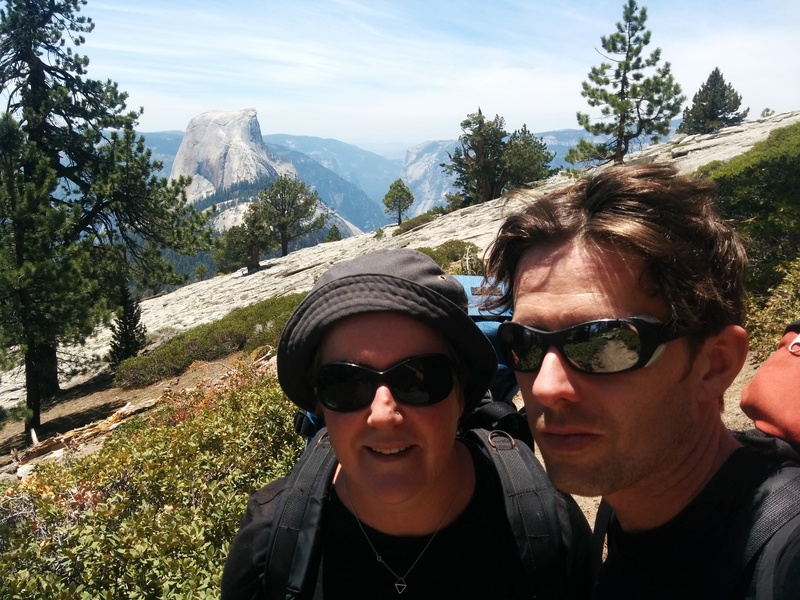 And, when we went to the Wilderness Office about 4pm we discovered that there were still permits available for our chosen hike starting the next day (no queuing necessary), and, something I hadn’t even entertained, we could add on a permit to climb half dome. Plus we were entitled to cheap camping the night before and after our hike. Score! So w e walked for three sublime days (OK, two and a half as we spent the afternoon of the first day lazing around a perfect alpine lake and being eaten by mosquitos) from Tuolomne Meadows, at a height of 8000 feet, up over Clouds Rest and Half Dome at nearly 10,000 feet, down to the valley floor at 4000 feet. Yes, I am glad we walked down rather than up, but that descending was hell on the thigh muscles! We were struck by the lack of snow. At this time of year there should still be quite a lot about, but California is into it’s fourth year of drought (the news here is filled with reports of water-saving initiatives – oh so familiar) and the snowpack is scanty – the iconic Bridal Veil Falls was reduced to a slight mist of water that had almost blown away before it reached the end of it’s long drop and a stream without water meant we had to make a three hour backtrack for water – the longest water run either of us have undertaken. 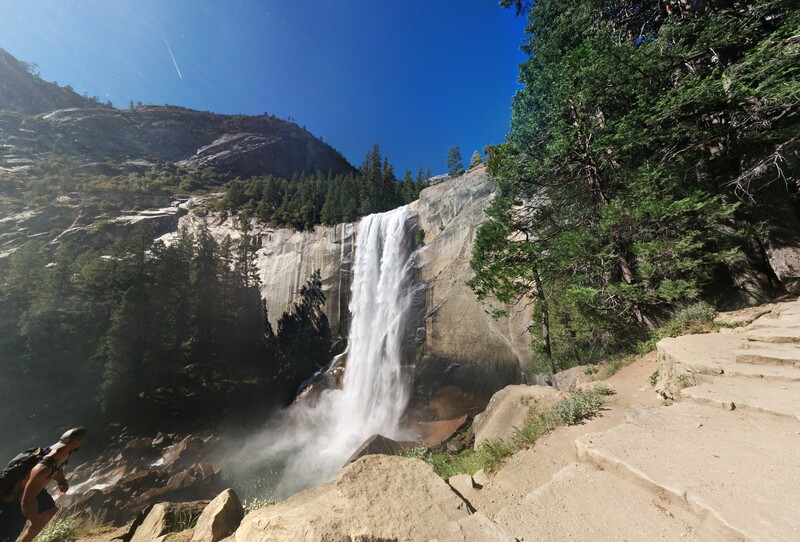 The water run was needed so that we could camp high up on the north east shoulder of half dome in order that we might get onto the cables to the summit before the crowds of day hikers arrived and the climb becomes something of a slow upwards shuffle. Our ploy worked and after a glorious night camped on our own (!) overlooking an amazing granite-filled valley 4000 feet below us we were climbing by 8am. The climb to the summit is quite something. 45 degrees most of the way up, the granite is slick from so many feet and despite best intentions we found ourselves hauling our weight up the cables using our arms (climbing tip 101: legs have more power and tire less easily). Exhausting, especially in the thin mountain air. The trip down, by contrast, was dead easy. In Europe this would be a ‘via ferrata’ route that requires wearing a safety harness and clipping to a cable for safety, but here there is only my strength and balance preventing a long slide down the mountain. And yet there are many less fit than I on this route. In fact, they are also almost all younger than I, and almost all dressed in the same outfit of brightly coloured, running clothes. It’s kinda like being in a gym. In other news, we saw a bear! I have been quite concerned about bears, and to Alan’s eternal amusement most diligent with bear-proofing our food each night. We had to carry a bear canister whilst hiking (all food goes in it and it goes 50ft away from the tent) and use food lockers in campsites. I imagined the bear fronting up to us for food and ripping into our bags and tent (which can and does happen). But this cub was minding it’s own business and foraging happily in the bushes near the backpacker campsite. So cute and cuddly-looking. My crush on Yosemite began 20 years ago – it was love at first sight when I saw an Ansel Adams picture on a friend’s wall. It’s a little bittersweet to realise that if I had come here 10 years ago I would have been climbing the rock faces rather than hiking the trails. There’s a sense of regret that I never made it during that stage of my life, but who knows what comes next? I might just have to get my rack out of storage for next time! But first, I’m off to have a shower to get that dirt out.